STORJ/BTC isn't bullish yet. It has been bearish heading into November. But since finding support at 0.00005000 BTC, it has been volatile and full of volume. Maybe it is gearing up for a bull run. 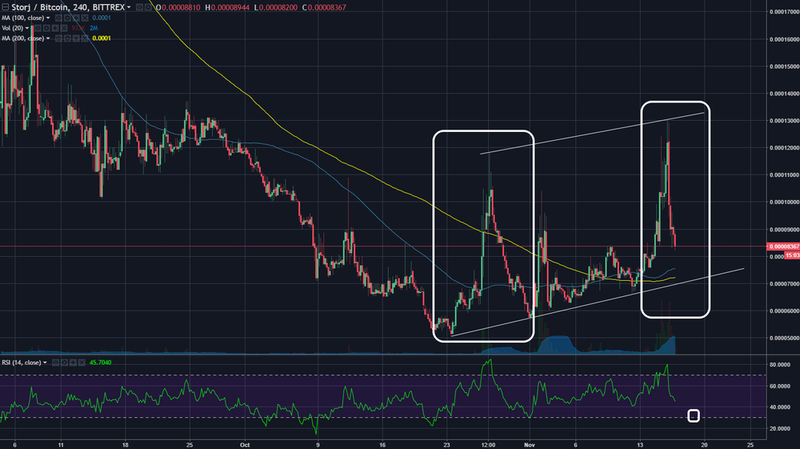 In the 4H chart, we can see STORJ/BTC in wild swings. We can say it is neutral with a slight bullish bias. The most recent pump-and-dump looks like the previous one at the end of October. We should probably wait for price to fall further towards 0.00007000 and the RSI back around 40 in the 4H chart.